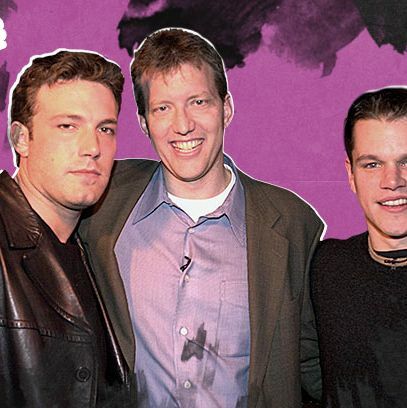 When the behind-the-scenes indie filmmaking series Project Greenlight first aired in December of 2001 on HBO, producer Chris Moore had already made one Oscar-winning film (Good Will Hunting) and even had his own blockbuster franchise (the American Pie movies). But when the show hit airwaves, while his producing partners Ben Affleck and Matt Damon were the famous faces of the show, Moore himself became something he had never expected: a reality TV star. Project Greenlight, the first show to get eliminated in Vulture’s reality TV bracket, which kicked off yesterday, detailed the process whereby a first-time writer and director, chosen through an online contest, was given a real budget and crew to make his or her first feature. Project Greenlight didn’t last long — just three seasons — and it may have just barely qualified as reality television anyway. Even today, Moore isn’t entirely comfortable using the term to describe the show. But in many ways, it was also a missing link between first-wave reality shows like The Real World and later, competition- and expertise-based shows like Top Chef and Project Runway. Moore talked to us about his memories of Project Greenlight, the show’s legacy, and the star of season two’s movie, Shia LaBeouf. Were you aware of the success of reality shows? Survivor had hit it big just before you guys did your first season. Was the success of shows like that in your minds as you went forward with this? It’s funny, we never thought we were anything like Survivor. It never occurred to us that we were in that category. We just thought we were making a documentary. In fact, that was the biggest argument that we had with Alex and Eli [after the show ended]: Was this really a series in any way? No one gets kicked off every episode. And we very purposefully weren’t going to create the drama [between characters] in any way. For us, the show wasn’t a competition. The guy had already won. The show was the thing after the winner. In fact, the Emmys changed their definition the second year of Project Greenlight because they had to create a separate category for shows that were more documentary-like as opposed to competition shows. So I would say we certainly knew Survivor was out there, but we in no way thought that we were in the same game as that. It was actually a show which later became American Idol, called Pop Idol, in England, that was sort of behind the scenes a little bit more. But even that was a competition to be a singer. And so we sort of felt that we were breaking new ground … we were making a documentary about this first-time director getting a chance to make a movie, and the larger picture of how it can change your life when you become a filmmaker. It’s a massive wish-fulfillment thing. It was a forerunner to some of the shows like Project Runway and Top Chef — shows where you’re actually learning something about a particular industry. In some ways, you guys were more reality than other reality programing: You were much less artificial in the construct you created around the show. You’re making a movie and somebody’s shooting the making of the movie. Yeah, about making Apocalypse Now. And that had done pretty well in theaters, and so we thought, Well, maybe we’ll go down that road. We felt like there’s a small market out there for it, and at that time, Matt and Ben were certainly famous, but they weren’t — you know, they were growing, coming up, and we thought we had a little bit of a hook with them as producers and that kind of thing. Chris Albrecht [then head of programming at HBO] was like, “This is a good idea, we can do this.” And once it got on the air, it was very successful, in my opinion, for HBO. It never became anywhere near as big as Survivor or Idol or something like that, but I was amazed at how many people really like it. People had a very visceral reaction to it. What do you think you guys could have done differently to make it last longer? We hit a couple tough roadblocks in the sense that the Weinstein company was forming and Bob and Harvey were leaving Disney. I think the switch from HBO to Bravo [in season three] was not a great idea for Project Greenlight, I think it fit better in that sort of non-commercial attitude [at HBO]. So I’m not really sure there was more we could’ve done, creatively. Honestly, some of it was also us; we were a little bit tired of playing these parts of the producers. Matt and Ben were getting very busy in their own careers, in their own rights. I think the other thing was that all this other programing was putting a lot of pressure on us to adapt to the new world of reality programming: Could we make it a competition? Could we have somebody get kicked off every week? That seems to be the holy grail of a good reality show: Somebody’s getting voted off the island, as they say. And I just don’t believe, and neither did Matt or Ben, that that was really gonna happen. Also, by the end of the third season, our company together, Live Planet, was sort of falling apart, to be honest. And so the drive to keep it together from any sort of corporate position wasn’t really there for us. You had Harvey sort of going through his departure from Disney; you had our company sort of reinventing itself and deciding what it was going to do; you had their careers sort of growing into much bigger and different things. And so it sort of felt like, for all of us, it was over. The last thing was, we weren’t 100 percent sure discovering screenplays off the internet was really leading toward massively successful movies. We did it in sort of that naïve belief that if Good Will Hunting had been out there and we had submitted it to Project Greenlight, then people would have gotten to watch us make Good Will Hunting, which would have been an amazing documentary. That was our initial thought process. And, honestly, we never found the scripts that were as good as Good Will Hunting. And that’s not to be selfish about Matt and Ben, it’s just saying that people are a little wary about submitting stuff on the internet, and the movies never turned out to be as big as the show. Let’s talk Shia LaBeouf, who came out of Project Greenlight. Do you keep in touch with him? What’s your take on what he’s been doing lately? It’s hard. I do not keep in touch with Shia. We have a very, very friendly relationship, sort of like you have with your high-school drama coach. He’s very polite and friendly and supportive about how he acknowledges Project Greenlight as a part of his rise and his story … Shia is a wildly talented person. He is very thoughtful and smart. You could look at some of the people out there — Mel Gibson, Marlon Brando, Joaquin Phoenix — everybody goes through their relationship with fame and stardom and they don’t necessarily come out the other side of it completely happy, and unfortunately I’ve seen a lot of it, with Greenlight, and Matt and Ben, and the American Pie kids. It’s a very rough personal road to go on. And in Shia’s case, whatever was going through his mind, either in making the short film and then the reaction to the plagiarism — I think in some ways, and I can understand this, that’s when your fame sort of annoys you the most. If any other kid in any other part of the world had made a short film word-for-word based on that guy’s [Daniel Clowes’s] thing and it played a couple film festivals, no one would care. And I think that’s what makes these guys feel a little bit angry. It’s hypocritical at a certain point, because you want the fame, and you like the life, but you wish you didn’t have to live up to it in some version. But, I do think Shia will come out of it. I do think he’s wildly talented. Emile Hirsch was also from Project Greenlight. Yeah. That’s a statement to the authenticity of Project Greenlight. The truth of the matter is those two kids were great actors. And they came in and were brave enough to audition for it and they put their best effort forward and they were damn good. It’s one of those things where that’s what I love about Greenlight, and I constantly think in this digital age how to get something like it back up and going. Every reality TV show character has a “persona,” like the over-the-top character. Those types of larger-than-life characters didn’t really emerge as much on Project Greenlight. But was there ever any pressure to push things in that direction? There were a lot of people who considered me the bad guy, or considered me sort of the pressure in the project. What I was getting very frustrated by was that what seemed to become the dynamic on the show … the professional filmmakers — as represented by me and by one or two crewmembers — hazing or sort of commenting or critiquing in an unfair way, the neophytes. There’s no chance that a first-time director’s gonna make all the right decisions with a group of professionals sitting there staring at him. It’s almost like initiation at a fraternity. And I didn’t like how it was going and I tried to change it, and I tried to be supportive. And I certainly got a lot of emails from a group of people who said they’d love to work for me and [that they liked] how I held people accountable. And I do that now; you can call my employees now and they’ll tell you that’s my personality. So it wasn’t that I wasn’t being me, it was that the dynamic was starting to get set up that the directors were sort of the lead characters, who were sort of put into this thing and the actors were always more professional, and the studio knew more and the producers knew more, and our job was becoming more criticizing them and letting them make mistakes, and letting them do stuff which I didn’t want to do. I felt like we should be producing these things and making sure they’re good. So part of it was that, and I would say we definitely fought against it. And I wasn’t being a bad guy; as I said, I was being the voice of negativity, or experience, or however you want to look at it. Tim Gunn represents on Runway what I wished I could have been and what I wished we could have had: someone who’s helping everyone try to win, right? And the judges, that’s part of the issue: We never really figured out the end of Project Greenlight. Who are the judges? In my opinion we should have released the movies while the show was happening and the last episodes of the show should have been “Did anyone go see it?” That’s how all of us in the film business are ultimately judged. Did you know when you guys first started doing the show that you would kind of become the front-and-center figure in that way? No. It was a total surprise. Matt and Ben loved it to no end. They loved me having to deal with it. I have this funny thing that seems to happen to me on every movie I’ve produced or worked on in some capacity since then: Somebody always goes on the internet and can find Ben Affleck’s imitations of me on Project Greenlight. And it makes everybody laugh still. It’s a very strange thing for people to have a relationship with you having never met you. I’m not that graceful about it, to be perfectly honest. And I try to be nice and whatever. But I love making smaller movies. I love making independent movies or dramas and things that don’t seem to be very popular right now. I think that if we tried to make Good Will Hunting right now it would be almost impossible. Unless Megan Ellison liked it.